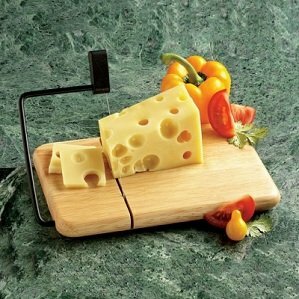 This natural Thick Beechwood Cheese Slicer, with built-in stylish black arm and handle grip, is one of our most popular models. The stainless steel cutting wire sinks easily into even the hardest cheese, to guarantee a perfect slice, thick or thin, every time. 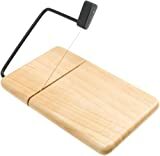 As with all of our cheese slicers, the wire is replaceable and has a lifetime warranty against breakage. Board measures 9.5 x 6 inches, has non-slip rubber feet and comes in a full color box.